That's awesome! I wrote a novel, too. Feel free to laugh at the topic or mock it. It's the story of Zombies as a misunderstood culture dealing with the question of isolation and engagement and the question of whether they should build a wall. It's more complicated than that, but I finished! Congratulations, John! Dude, zombies are hot right now. They film a zombie TV show here in Atlanta. So cool, and in your first year of a new job! I am just trying to tread water in my first year of AP lit. My head is crammed with shakespeare & Faulkner right now, no stories of my own brewing. Can't wait to read it! I think the new job is partly responsible for my being able to finish. Now that I am mostly in technology, I don't bring papers home. I get my Writing Seminar papers graded at school, where I have fewer distractions, and I don't spend as much time planning lessons. You must be tons younger than me as you have a lot of energy, girl! That being said, I congratulate you. I've started Nanowrimo a couple of times but haven't ever finished my project. Your article above about your experience inspires me to keep trying. Congrats! 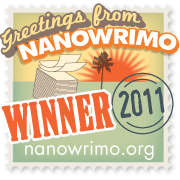 This year I took a deep breath and introduced all my 8th grade students to NaNoWriMo. It has been a huge success! The local news even picked it up, which thrilled my kids. They speak of themselves as real authors now. We can't wait to get their free published copies of their novels! NaNoWriMo for Young Writers rocks! Congratulations to you and your students!